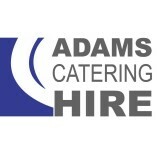 Award winning Adams Catering Hire offer a complete range of equipment for every type of event. From a small intimate bespoke dinner to large corporate events, we have the solution. Working closely with many of London's top caterers and venues we understand the needs of any event.